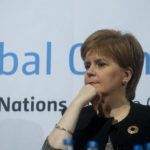 Scotland’s biggest campaign coalition has welcomed news that First Minister, Nicola Sturgeon, is to attend crucial United Nations climate talks in Paris. Tom Ballantine of Stop Climate Chaos Scotland said: “Scotland has a good story to tell on climate commitments, with world-leading targets on carbon reduction agreed unanimously by all parties in the Scottish Parliament. “The Scottish Government’s Climate Justice Fund is another example that other wealthy nations should follow, helping people living in some of the world’s poorest countries deal with the damaging consequences of climate change. “We are pleased that the First Minister will take those examples to the other nations of the world.